Can anyone tell me my kitten’s breed? Hi All, hope you are doing well. I have had this kitten for over 4 months. 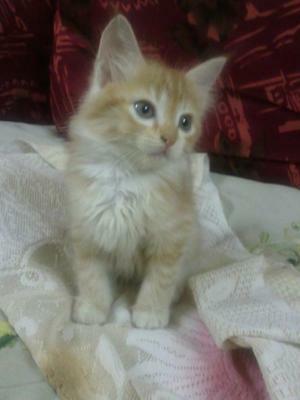 Its a female orange tabby kitten. Its name is Webby. She is very playful and very friendly kitten. Everyone adores her when ever they see. I have had doubts about the breed of this kitten. The vet told me that it's a mixed Australian Mist. I am not sure what kind of breed my cat is? Can anyone find this out for me? Hi Mohamed... Nice to hear from India again. Thank you for sharing and showing us Webby. Webby is a very nice looking cat. She is an orange (red) tabby and white random bred cat in my opinion. You made the same assessment as to coat type. As you know tabby cats are not a breed but a coat type - see tabby cats. I don't think that there is any connection with the quite rare purebred cat, the Australian Mist. There aren't that many purebred cats in India. I would have thought that all the purebred cats are known. And as you ask what breed of cat Webby is, you are implying that she is purebred. She is much more likely to be a genuine mixed breed or random bred cat. That said, she is a fine cat. I live with two random bred cats myself. This page: What Breed Is My Cat discusses this topic further. I love hearing from India because I know the country a little and the cat world is very different there to Europe and North America. Can anyone tell me my kitten's breed? What a pretty little kitten Webby is. It doesn't really matter what breed she is as I'm sure she will bring you much happiness in your home.